Doug: One of the books I picked up at WizardWorld Chicago back in August was the DC Comics Library edition of The Flash of Two Worlds. 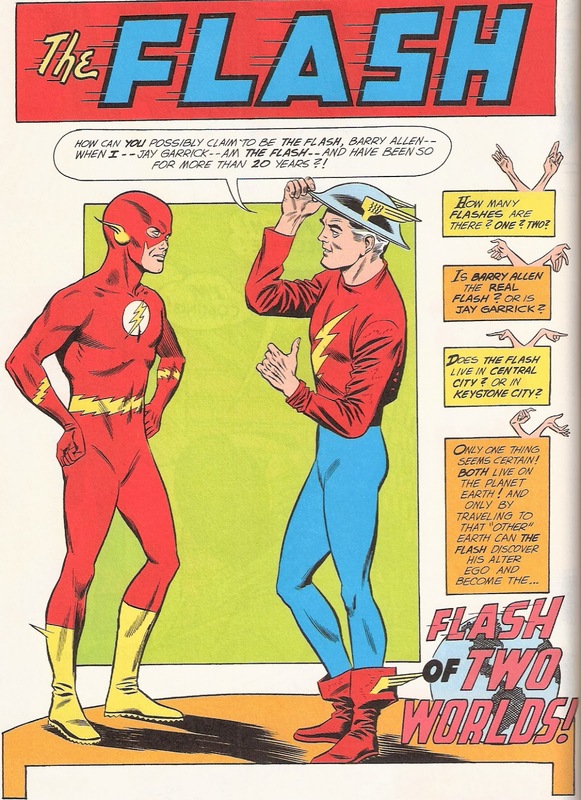 It contains the first six meetings of Barry Allen and Jay Garrick, from The Flash #s 123, 129, 137, 151, and 170. Today we're obviously going to discuss that first landmark story, a tale that touched off DC's alleged continuity quandary that would result in the "Crisis on Infinite Earths" event and then ultimately the undoing of most of that. Ugh... But hey, this is a fun story, so let's wait to dwell on its future until the comments section. Doug: I have to say from the start that Carmine Infantino's art (of which, at least in the Bronze Age, I am not a fan) throughout this story is pretty darn good. 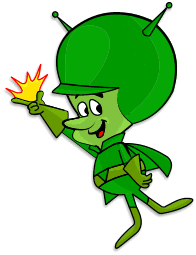 However, could the Barry Allen Flash look any more like Gazoo in that splash page? What a huge melon! But what an incredible cover -- truly, that image has to be one of the highlights of any age of comics. And how exciting would that have been for a youngster picking this one off the spinner racks (hey, were spinner racks invented in 1961?)? Help a brother out, here -- was DC reprinting their Golden Age material as the Silver Age was dawning? I do not know the answer to that, so I'm wondering if a 10-year old in 1961 would have recognized the Jay Garrick Flash? Surely his old man would... Let's get on with the story, which at a whopping 25 pages felt like an Annual to me. Doug: Barry Allen is of course late to a commitment he'd made to Iris West. Iris is chairing a fundraiser for a local orphanage, but is furious as Barry arrives. He assumes it's because of him, but he really had a legitimate excuse this time. But no, she's upset that her magician who was tabbed as the entertainment for the children hasn't shown up. Barry says he can't stay (wait, weren't they supposed to be together at the fundraiser? ), but wonders if Iris would like him to phone the Flash as a potential stand-in for the magician? She's elated, so Barry slips away, pops his special ring, and emerges moments later as the Fastest Man Alive. 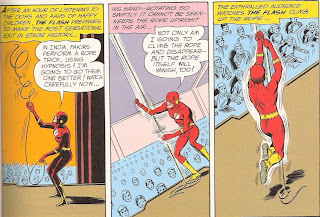 The Flash goes through a litany of skills and showmanship, but stuns the crowd when he climbs a rope that he's set to spinning beyond the human eye's capability to see and disappears. Doug: Flash is next shown on a country road, still holding the rope. He wonders where he could possibly be, and then muses that he could have vibrated so fast that he broke through time and space. Call-out to Flash fans -- had Barry ever done that before? 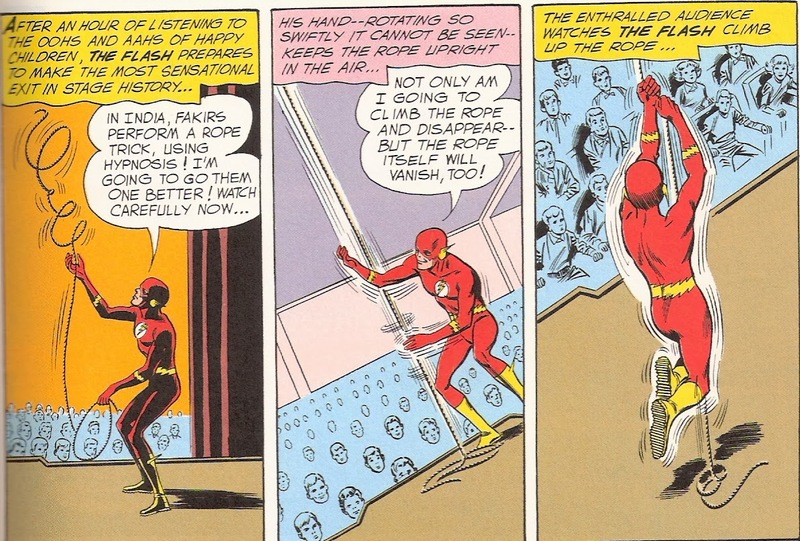 I would assume that this is the first time doing any sort of warping, but I don't know -- the fact that he thought he could vibrate the rope and make himself disappear and then reappear has me wondering. Assuming he's outside Central City, the Flash sets his course back toward where he thinks the city is. But as he enters the city limits, all is not what he'd thought it would be. Many of the landmarks that he expected are not present. He now wonders if he's gone through time and has emerged at a time in Central City's past. 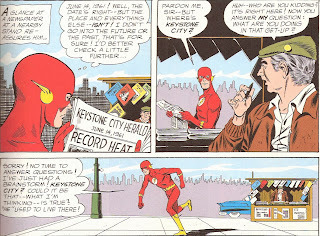 Running to the spot where he thinks he'll find Iris's place of work, he's stunned to see that instead there is a building housing the Keystone City Herald. Now thoroughly confused, the Flash runs to a newsstand and picks up a paper. It's date? June 14, 1961 -- "today", as far as the Flash is concerned. He asks the vendor where Keystone City is located, and the guy looks at him like he has three heads. Then the Flash begins to really wonder -- a guy he knew before used to live in Keystone City. 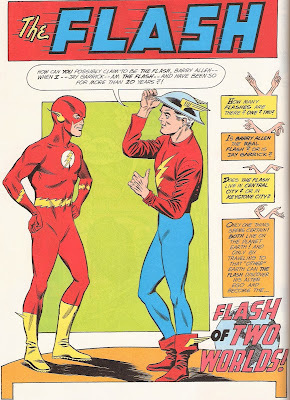 A guy named Jay Garrick, the original Flash! But wait -- that was only in the comic books! The Flash finds a telephone book and sure enough -- there's a Jay Garrick in it. So, a quick run and a quicker change, and Barry Allen is about to announce himself to a childhood hero. Doug: Barry rings the bell of Jay Garrick's apartment. Garrick opens, and Barry says that he recognizes him. Jay's of course a little weirded-out by this, but humors his guest. 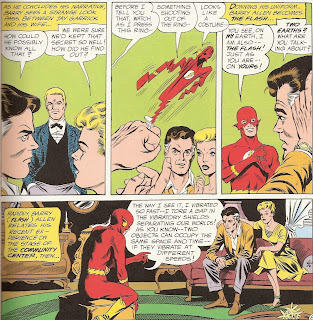 We get a nice recap of the original Flash's origin told by Barry, which further confounds Jay and his wife Joan. As they lament the "secret" no longer being so, Barry says to wait -- he has something to show. He activates his ring, and out pops the Flash costume which he dons. Now seated in full hero garb in the living room of the Garricks, Barry surmises that he must have somehow vibrated through a space warp and landed on an alternate Earth. Barry further guesses that the two Earths vibrate at different frequencies, which keeps them apart. 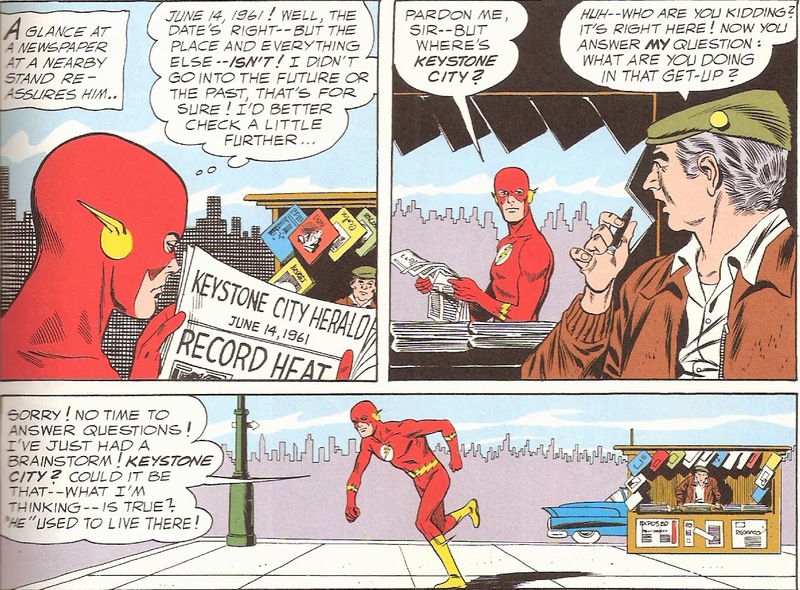 On his Earth, Central City is very much like Garrick's Keystone City, with a few pronounced differences. Barry then relates his own origin, and tells how he was inspired to become the Flash after having read the adventures of Jay Garrick. Garrick is astounded -- how did Barry read of him?? 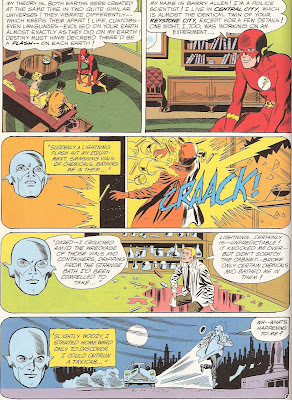 Barry then does a bit of fourth wall-breaking by bringing writer Gardner Fox into the tale. Barry says that Fox wrote of the Golden Age Flash, and alleged that the adventures came to him in dreams. 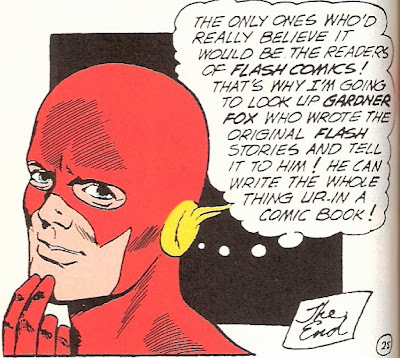 Barry wonders if somehow, while sleeping, Fox was "in tune" with Jay Garrick's world. 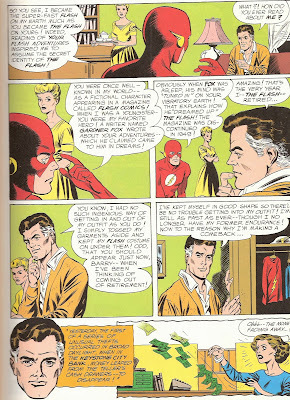 Barry says that Flash Comics ceased publication in 1949; Garrick is amazed, as that was the very year he retired as the Flash. OK, kids -- there is the explanation for DC's multiple Earths. What do you think? Doug: Garrick says that lately he's been thinking of coming out of retirement, and relates to Barry some crimes that have happened locally. Of course, Barry says he's in if Jay will have his help. Oh, how the seeds of a team-up for the ages are sown! 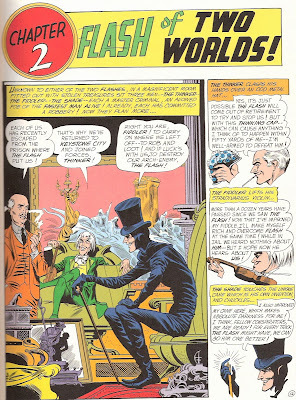 Doug: In the second chapter we are (re-)introduced to three baddies from the Golden Age Flash's rogues gallery: the Thinker, the Fiddler, and the Shade. Of course, by modern standards these three dudes wouldn't cause most heroes to break a sweat, but as many of DC's villains go they each have a schtick. The Thinker wears an army helmet with all sorts of wires on it -- he can cause anything he can think of to actually happen if within 50 yards of him. The Fiddler can cause strange accidents to happen by playing his Stradivarius (and riding in his Fiddle Car, no less). The Shade uses his cane to create absolute darkness. The three do-badders plot to a) steal the Neptune Cup from millionaire Edward Jarvis (hmmm... you think that's Edwin's long-lost twin? ), b) steal the "European crown jewels" (there's a European crown? ), and c) steal a collection of historical curios. Say, did you ever wonder who fences all of the loot that comic book bad guys steal? Doug: As the rogues get on with their crime spree, the Flashes decide to separate and attempt to cover the city faster. The GA Flash comes across the Jarvis mansion, and is warned by two watchdogs that the Thinker is inside! Odd, but when you're in the superhero biz I'd assume you reach a point where nothing surprises you. 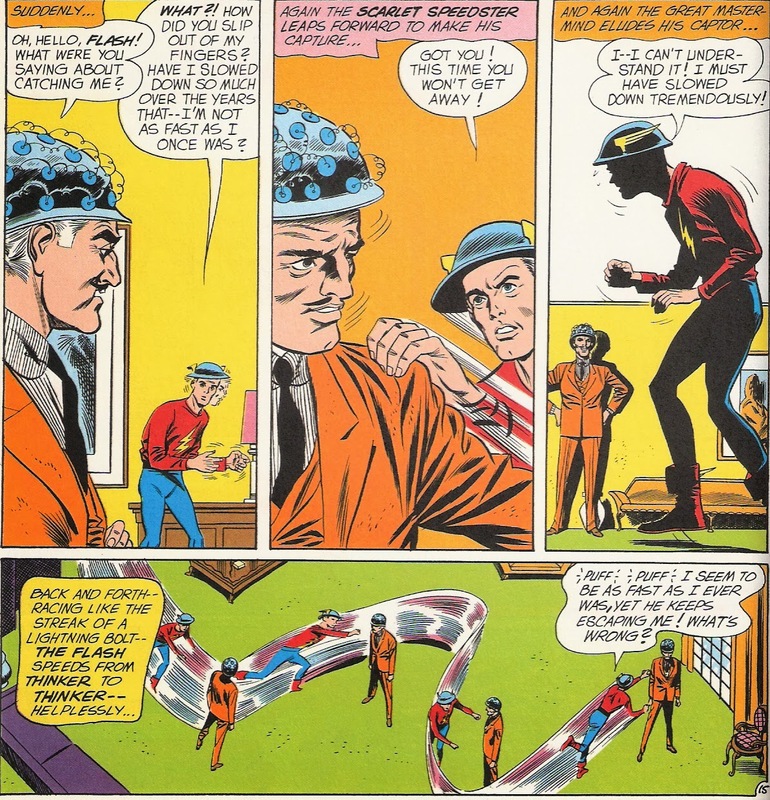 Flash enters the mansion, but the Thinker uses his collander-doohickey to trick Flash into thinking he's caught his man. 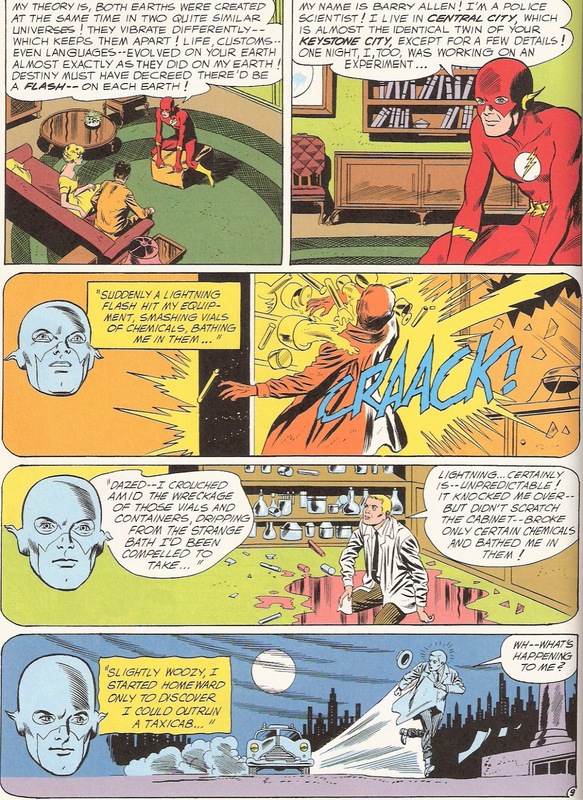 Flash literally gets tired running around the Jarvis study chasing the Thinker, and finally slams headfirst into a door. Barry Allen is tracking the Shade to a ship offshore of Keystone City. The ship is engulfed in darkness, but once aboard the Flash whips the murky ether into a pillar. The Shade sees this and uses it as his cue to depart. Jumping into a motor boat the crook speeds away. 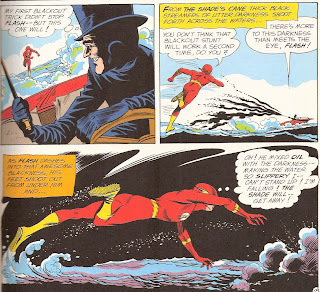 The Flash follows him, running on the water. 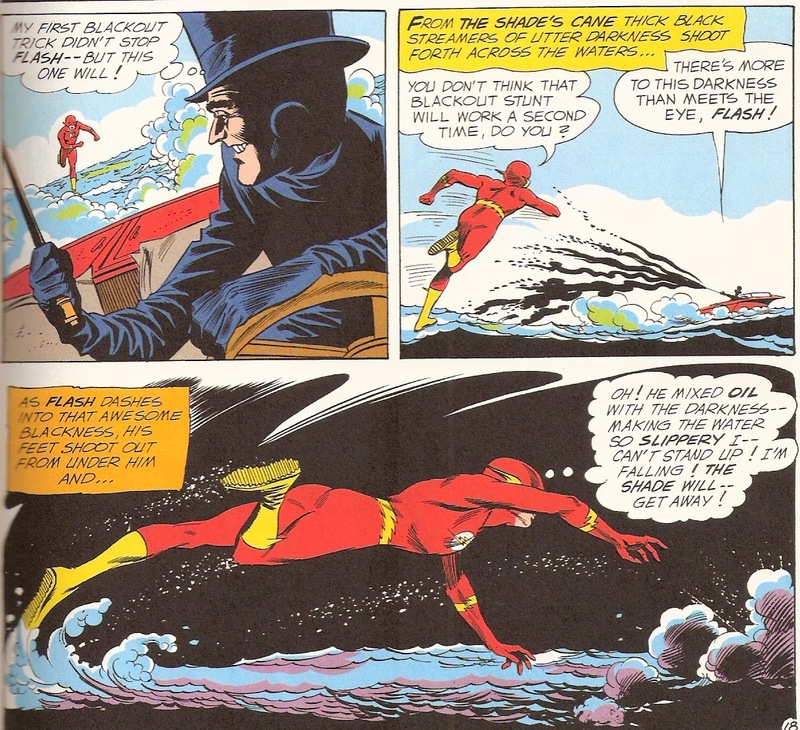 The Shade uses his cane to not only emit the dark stuff, but by mixing oil into it the Flash loses his concentration and begins to sink into the sea. Super-baddies 2, fastest men alive 0. 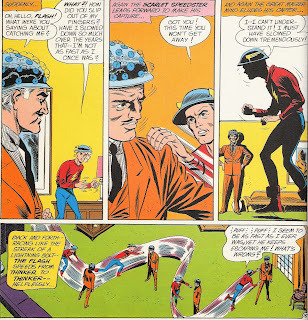 Doug: The chapter just past shows why books like All-Star Comics were fun, because the Justice Society would be broken into smaller teams to solve crimes and bad guys. I suppose it was somewhat of a nod to that past here in breaking the Flashes apart. But as we segue into chapter 3 we get what all youngsters wanted in the first place -- these two titans teamed as one! We haven't seen our heroes deal with the Fiddler yet. Rectified. As the Beethoven lookalike rides through town on his Fiddle Car (seriously -- see for yourself), the Flashes race toward their encounter. On the way, though, we get the scene that the cover was drawn from (or vice versa -- no idea which came first). The Flashes divert their path to save a construction worker menaced by a falling steel girder. It's a nifty bit of teamwork, and foreshadows (we hope) what they'll do to the soon-to-be-assembled rogues. But in the meantime, they encounter the Fiddler. Away from this area of town, the Thinker and the Shade get back together and relate their adventures. In recounting the play-by-play, they determine that there must be two Flashes -- the Fiddler could be in trouble! They race off to help their partner, only to find him playing away as our heroes dance like puppets for him. Not good. Doug: The Fiddler gloats to his buddies about how simple this was, and that he actually got the Flashes to steal the crown jewels. He says as a final show of his power, he'll freeze the Flashes in place for 24 hours. As the villains turn to leave, however, the Flashes suddenly run toward them and overpower their enemies with the element of surprise! At the local precinct, the Fiddler wants to know how the Flashes were able to resist him. Simple, Jay says -- the Fiddler neglected to order the Flashes not to try to escape. Additionally, when the Fiddler ordered Jay and Barry to bring him the larger jewels, they took the smaller ones and inserted them in their ears, thus distorting the musical commands. That, pals, is how they resisted! Later, Jay and Barry congratulate each other on a job well done. Jay pledges to go on being the Flash -- because you know, if he stayed retired we wouldn't get to do this again! Barry spins his body, hoping to duplicate the vibrations that allowed him to breach the barrier between their Earths. He re-materializes on the stage from which he'd left -- but in real time. Everyone has gone home! Racing to the newspaper, he finds Iris and tells her that he had to leave... on a most unusual mission. She of course scoffs, and our hero thinks that the only person who would believe this is... Gardner Fox. And he's going to look him up to tell him! Doug: That was a lot of fun! I'd never read this story before writing today's review. I know I have a reprint of it in my copy of The Greatest Team-Up Stories Ever Told, but I sure don't recall having read this before I bought the Flash hardcover that I've used as my resource today. Anyway, enough about my memory. I would think that as a kid my eyes would have been wide with the possibilities of a story like this. Parallel Earths where heroes from the comic books lived. Wow! I for the most part am in the continuity camp, but I'm not so tied to it that I can't accept that what went on in Marvel Team-Up could conflict with the rest of the Marvel Universe and it would be OK. So that DC felt that they were creating these convoluted stories that people couldn't understand seemed silly to me at the time, and it does now. If nothing else, I think many of us would agree that what came after the "Crisis" had more warts than what had gone before. That being said, I am glad that we got John Byrne on the Superman books, Mike Grell on Green Arrow, George Perez on Wonder Woman, etc. That was, at least in my collecting life, a golden age all its own for DC. But regardless of what this story wrought in its wake, it was a fun tale and ushered in many a fun tale subsequently. Yearly meetings of the JLA and JSA? Bring 'em on! It started off as a rather inventive, charming, and comicbooky way of DC to reconcile in-story it's own publication history. Plus it's always nice to have a passing of the torch moment between the elder hero and a younger one who bears his same name or mantle. But the more it was revisited the more of a pandoras box it seemed to open once fanfic thinking creeped in. Which meant it or course couldn't stay a contained situation where we have fun with it once in awhile and then they leave it the hell alone. ..and attempts to close the box haven't been much better because DC not only makes some really asinine decisions about what to keep and what to change when things get to convoluted but they also won't even fully commit to it. "Okay everything is starting over...except the stuff that was selling well before we decided to do this, the stuff from the editors who refused to play ball, and the stuff we merchandise." I confess I rather like the idea of being able to just point and say "That's Superman. That's Batman. That's Spider-Man." Without having to constantly quantify it with stuff like "Earth 2" or "616". Hell, it's hard enough having to explain that I love a character even though I haven't his comic in several years. At least with Flash though there is the legacy thing so you're talking about different people with basically the same powers from roughly the same source who are part of a ongoing heroic tradition. As opposed to multiple versions of the same guy or girl running around at the same time. We could have had Byrne on Superman, Grell on Green Arrow, and Perez on WW, etc., without that godawful Crisis. Maybe we would have been spared that horrid Luthor-as-Gordon-Gekko and JLA-with-Black-Canary-as-founder nonsense. mind had no trouble understanding it. Same with Earth S, Earth X, and so on. I never really cared much for the Earth 2 versions since Barry and Hal were my Flash and GL, but it was never confusing. DC spent, what, 25 years post-Crisis trying to fix the problems created as a result of that misbegotten concept, then had to trash its entire history and start the Nu-52...tells you how well the Crisis worked at "fixing" what wasn't broken. The only saving grace of Crisis was art by Perez. AFAIR, DC seldom, if ever, reprinted Golden Age (i.e., WWII-era) stories in the early Silver Age. One reason was that the artwork was often below DC's 1960's standards. 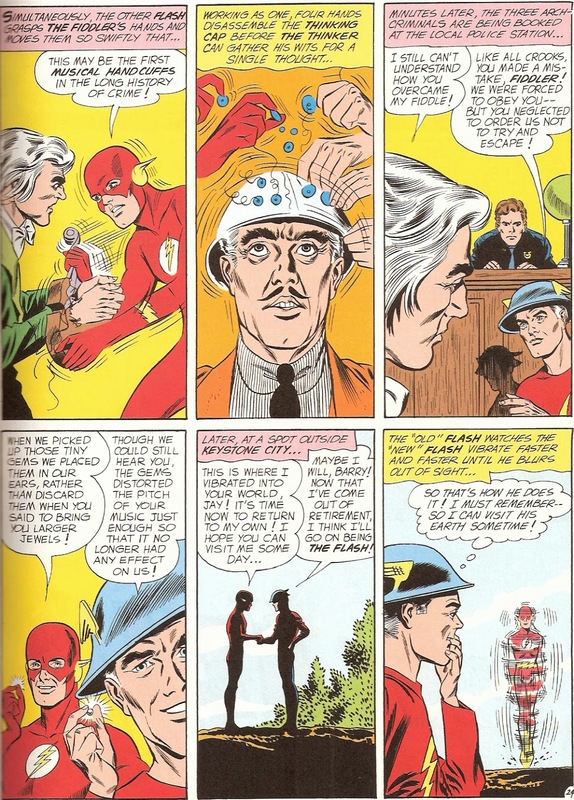 After the Earth One/Earth Two concept was introduced, they began occasionally including some Jay Garrick reprints in their Flash 80-page Giants. Golden Age reprints became fairly common as back-up strips in the early 1970's. I suspect that when DC revived (and revised) the Flash, Atom, Green Lantern, and Hawkman, they did not expect any complaints about the changes. Similarly, Marvel probably did not worry about continuity glitches when they revived and retconned their Golden Age characters. There was an assumption that the readership turned over completely every seven years, so the kids reading comics in 1961 would not remember the earlier versions. Then the publishers started getting letters from people like Roy Thomas, and had to come up with some explanations. And, yes, I agree that the Crisis and subsequent reboots and retcons just caused more problems than they solved, especially since the creators never can seem to make up their minds what to erase and what to retain. 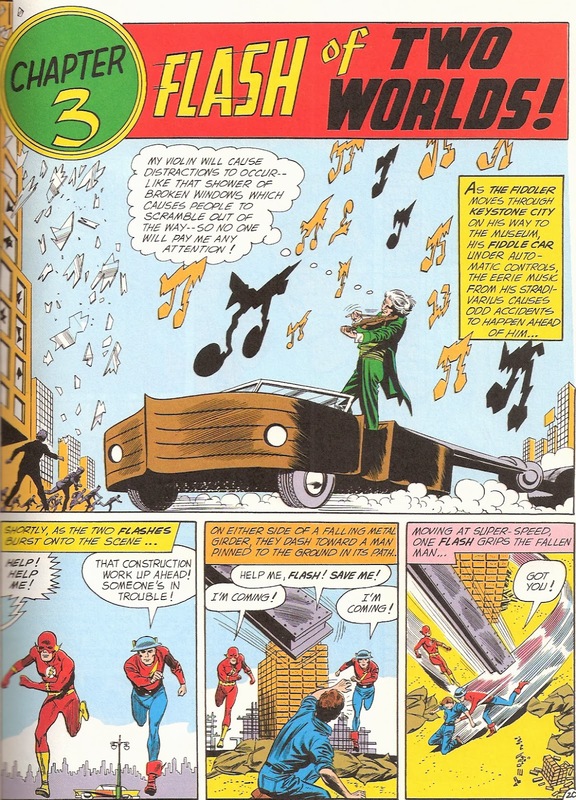 I read Flash of Two Worlds the first time it was reprinted in the 1965 Flash Annual - that story alone made me a Flash fan. It wasn't until a year or two later reading Jules Feiffer's The Great Comic Book Heroes that I discovered the Earth 2 heroes had been around for years and had starred in their own features. Anonymous makes a great point. What if they tried something like 'Crisis' back in the '60s..? Once you decide who goes/who stays/who changes, the company HAS to stand behind it. As you read in the Untold Stories book, the industry near the late '80s was really getting desperate with gimmicks ('Death of'.., foil covers, bagged special issues..). If they would have just stuck the course of good writing and forget the 'revenue-clincher-of-the-month' shtick, but one must stay competitive, one supposes. One could argue that the dozen different 'earths' are just another flavor of bringing characters back (post-Crisis), but it was done with much more simplistic creativity for the joy of readership, not to generate a blow-out revenue month. I dunno. I'm still disappointed with Marvel over the Gwen Clone saga.. I really didn't think Stan Lee would cave as he did. I had no trouble understanding pre-Crisis DC, and I always loved the annual JSA/JLA team-ups. Even so, the first few post-Crisis years saw DC producing a lot of good material in my opinion. It seemed like a shot in the arm that didn't, alas, have any lasting impact. As for this story, I've never read it, but thanks to DC's many reprints in the Bronze Age (yes, Doug, those digests again), I've read quite a few of these early Flash stories. 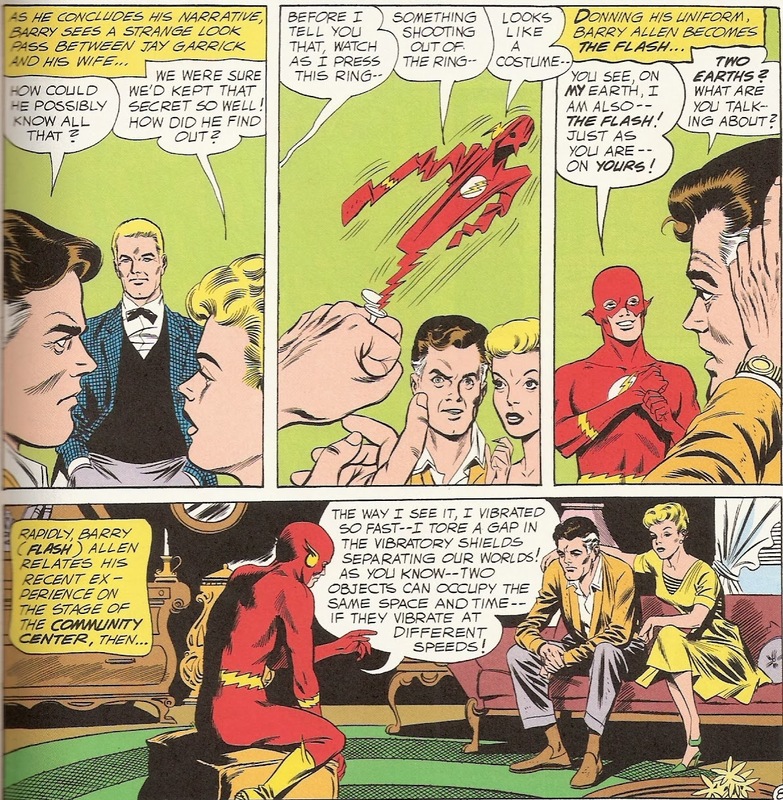 You note something here that was sort of an amusing leit-motif in Flash comics before he got married: the fastest man alive always being late for dates or other engagements with Iris. One thing I really like about this story: that awesome fiddle car! I've never read that seminal tale, but feel like I have now. Thanks Doug. yes, who knew what would come from that meeting? I really liked the multiple Earths of DC. As others have said, I had no problem understanding it as a kid, and it set DC apart from Marvel. I still feel that Crisis was one of the worst things to happen to DC. And now I hear that they are going to reboot their line yet again! It's an addiction with them, it seems. I'm glad I stopped reading DC a few years ago. Who knows what their characters' histories are any more? Thanks, everyone, for the conversation today. Karen, as you and I have agreed in our editorial meetings (which of course take place 2000 miles and two time zones apart, and without donuts), we need to supply plot synopses to our reviews. I know sometimes we both struggle with just how detailed to be. I always hope that I give our readers a thorough understanding of the book's plot without killing any future joy of reading for them. But in the case of historically important issues (this, ASM #s 121-122, and 129, Hulk #181, Batman #251, etc. ), sometimes it's best to err on the thorough side. Fiddle Car, included! Matt C., I'd like to think that we'd have gotten those superstar creators on some of DC's most important characters, but I'm afraid that the temporally close hiring of some of those folks is so linked to the marketing of DC post-Crisis that I can't be sure their talents would have seen the light of day as we knew it back in 1986. But I definitely hear you on some of the revamped characterization and revisionist history that took place. MattComix, you are a cynic after my own heart. Keep preachin', brother! @Doug I usually don't consider myself a cynical person in terms of overall faith in humanity and a brighter tomorrow. But editorial decisions at Marvel and DC can sorely test anyone's idea of a glass being half full. My apologies for the implication about your greater self -- no harm intended. Your point, though, about comics (specifically modern comics) was where I was (am) at anyway. @Doug. No need to apologize, I wasn't offended or anything like that. I'm glad you appreciate my posts. I just sometimes wonder when I voice my frustration with modern comics if I might be coming across as more bitter a person than I actually am. Just a thought, I have to wonder how much that original Star Trek episode about the Mirror universe — seen no doubt by the same sorts of kids who were reading comics — helped make it easy to understand the whole Earth-1, Earth-2 schtick. I, too, was never confused by the concept, having read at a young age "The Man In The High Castle" and Oscar Lewis' Lincoln alt-history, "the Lost Years." Not a hard concept to"get." I always liked Earth-2 (which, of course, SHOULD have been called Earth-1 :-), and considered the E-2 Superman THE Superman, the rough-at-the-edges original superhero. I found the mix of aging and invulnerability fascinating... still do. As far as Marvel and DC go these days, not only is the glass half-empty, it's half-full of urine and time to toss it out. I have mixed feelings about this kind of thing. 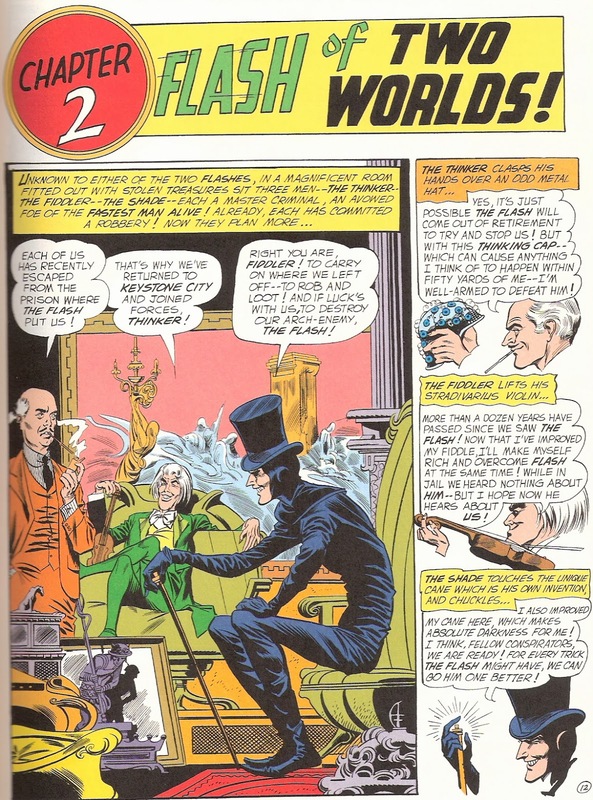 On the one hand, looking back the whole Earth 1, Earth 2, Earth X stuff was a simple and elegant way to not only explain discrepancies, but allowed for more imaginative takes on characters to be created - like want to create a version of Batman who is really Mister Mxyzptlk? Create Earth Q or Earth 919 or whatever and tell the story! On the other hand, I remember liking the epic nature of CoIE and appreciated just how difficult it must have been to try to do something like that. So I have fond feelings for it. Plus, it gave us "Whatever Happened to the Man of Tomorrow" - which ranks among the best Superman stories. Overall, I like this Flash of Two Worlds stuff - sure it opened a Pandora's Box, but so what - comic continuity isn't built, it is accreted - there is no way to make it all work - it is by its very nature (serialized, fragmented, multipliticiously written) an incoherent form. It is the READERS who give it sense - I say the writers should just write the best stories they can to without being particularly beholden to continuity. Count me among those who was somewhat confused about the whole "Multiple Earths" concept. I recall wondering "if there's an Earth 2 Superman, does that mean there's a Kryton 2?" But I could live with it, since I was never a big fan of the DCU anyways. But I did like the Crime Syndicate, since I've always been a big fan of "evil versions" of heroes. Getting back to the story at hand, this is a splendid example of Fox-Infantino at their finest story-telling abilities. I'm a big fan of Infantino's Silver work, very clean lines, clean modernistic buildings and cityscapes as some folks have commented on before. As early as 1961, you see here the soon-to-be-copied floating head narratives, sharing flashbacks (sorry..) almost as if it's directly to the readers but not. It was a distinctive yet warm story-telling technique Carmine was notorious for (both here, Batman and Elongated Man, among others). Yeah, that 'Fiddlecar'.. You always wonder what the gas mileage is like on those..? And as Edo noted, the in-joke of Barry always being late with Iris..? Priceless. Sweet Fiddlecar! And nice art by Infantino. Thanks for the review...I'd always seen the cover, never read the story. These 3 villains actually have good powers to combat the Flashes' speed. This was named the best single issue of 1961 by the Alley awards, and Infantino the best artist of the year. I dreaded his bronze age art even more than Don Heck's, but his art in this period is great, despite the big heads! That angular energy is balanced by clear definition of forms. Great concept by Fox. I loved the Earth-2 crossovers, and the other Earths with Shazam, the supervillains, Freedom Fighters of WW2, etc. Crisis made the DC universe small and boring, instead of expansive and imaginative. My feeling is Crisis was done wholly because DC was envious of Marvel's superior sales and they figured, Hmm...all the Marvel stories are in "continuity" and take place in one world...maybe we can do that too! In so doing, and by trying to Marvelize heroes like Superman and such, they lost everything that made them the Chips Ahoy to Marvel's Oreo and just became like a half-chewed leftover Hydrox that no kid would want unless the real Oreo wasn't available. Forgetting that folks can enjoy both Chips Ahoy and Oreo...there were some really good comics from DC post-Crisis, but very few of them were in the mainstream super hero setting. Most were still alternate worlds like Dark Knight Returns, Watchmen, etc., or only barely even "DC comics" like Sandman and Constantine. So what did DC gain by making its brand a poor man's Marvel? No offense to those that prefer Hydrox to Oreo. Is "Recent Comments" not working? Although I'm familiar with the iconic cover and the basic story, I've never actually read it -- although I did note in this review that it was set on June 14, 1961, exactly one year before I made my debut as the Fred of One World! 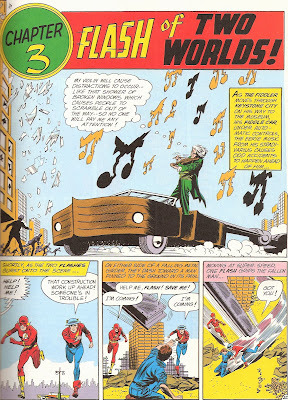 (well, ok, one of multitudes of Freds ...) I wonder if another, underlying reason DC decided to whittle down the "infinite worlds" is that Jay Garrick and other characters of those other worlds were, as characters tied in to World War II, were getting too old. After all, in this story, Jay could have still been in his early 40s, but 25 years later? Personally I didn't much care for Marvel's solution for Nick Fury, the Infinity Formula -- yeah, fine for Nick, but since several of his old WWII buddies were still being used in then current 1970s stories, including "Godzilla: King of the Monsters", it seemed they were expecting us to forget that Gabe Jones & Dumm Dumm Dugan were in the same age bracket as ol' Fury, and Dugan appeared to be at least a few years older in those old Sgt. Fury comics. Now days, of course, we have multiple Marvel universes with duplicate versions of all the most popular heroes & villains & supporting characters. I think most people (kids or adults) inclined to get into such fantasy worlds wouldn't have much problem figuring things out, especially when they can go on the internet and find sites to sort things out for them if necessary. Although I wasn't buying DC in the '60s or '70s, I did get some Marvels that weren't set in their regular time/place, and somehow even as a callow youth I never thought that because Conan the Barbarian had that Marvel logo across the top of the cover, it must be taking place in the same universe inhabited by Spider-Man, etc. BTW, speaking of kids, back in the day I had enough trouble getting enough change to buy all the comics I liked even when they were still a measly 21 cents (with the one cent tax) each. Are most kids these days really getting that much more of an allowance that they can afford to buy 20 or more titles a month if they were inclined? Even as a single middle-aged middle-management civil service clerk who just has to worry about maintaining myself and a couple of cats, I have to budget myself and I can't see spending $70 or more a month for the same number of comics that would have been only $20 + tax even after they hiked the price up to 50 cents. Yeah, there were many different worlds back then, and even the one we actually live in has dramatically changed since those two Flashes came racing towards the comics fans a little over 52 years ago. Heck, Barry Allen and his fellow DC heroes didn't even have to worry about competition from some upstart if Marvelous group just yet ... although the FF were due to launch into space just a few months later. I was a big fan of multiple earths, especially Earth 2. Roy Thomas had jacked up the Earth 2 house and built a solid foundation with the All Star Squadron. The JSA stories of the 70s is where I came in. Totally enthralled me. I enjoyed it when the JSA passed the torch to Infinity Inc too. I remember reading a reprint of an old 40s Superman story. Clark Kent and Lois were watching a newsreel about Superman. Clark had to come up with ways to distract her, so she couldn't see his identity revealed on screen. Based on the later DC idea, I guess CK & LL slipped into another Earth and didn't know it. What a strange and yet entertaining story. The really weird thing about that 1942 Superman story is that Clark kept distracting Lois, but he did not seem worried about the other audience members. Apparently, on that Earth, everyone except Lois knew his "secret" identity. Of course, it could not be considered canonical. When it was first reprinted (Superman #183, in the 1960's), it was billed as "our first imaginary story." It came out alongside the release of the first Fleisher Superman cartoons IIRC. Love those Superman cartoons that take place on Earth F(leischer).